With the continuing support of the DUP, Theresa May has defeated a vote of no confidence in her Tory government at Westminster by 325 votes to 306, less than 24 hours after she failed to win parliamentary approval for her Brexit deal by a historic margin. The result means that Britain’s Labour leader Jeremy Corbyn has failed to force a general election, and Britain and the Six Counties are still on course for a chaotic departure from the European Union within weeks. Amid increasing uncertainty, May told MPs she is to begin talks with what she has called “senior parliamentarians” from across the parties, to establish what kind of deal might win the backing of the Commons. But there are no indications of any potential compromise. Amid jeering from the Tory benches, Corbyn called for May to rule out the prospect of the “catastrophe” of a no-deal Brexit, an appeal which May did not respond to. Last night’s 230-vote margin against May’s deal was the biggest in modern British parliamentary history. The 26 County Taoiseach said that his government “profoundly” regretted that rejection, adding that the impending no-deal scenario would have a “deeply negative” effect on peace and jobs in the north. With negotiations back to the drawing board and an election off the cards, a disorderly Brexit at the end of March can only be avoided with the extension of Article 50, or a second referendum, neither of which command strong support at Westminster. Work on Ireland’s contingency plans will continue, but Mr Varadkar told the Dublin parliament “these are no longer contingency plans, they are being implemented by government”. He said businesses and other organisations must now do the same. 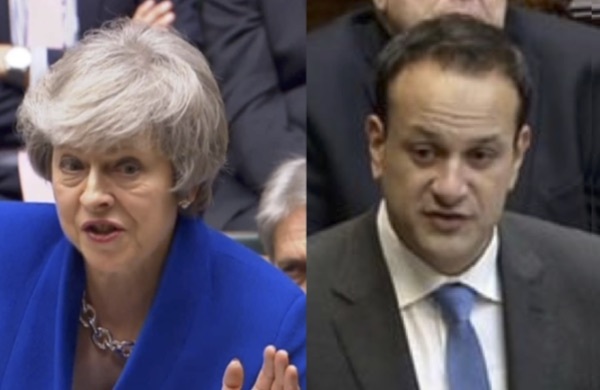 Speakers in the Dail also condemned comments by DUP leader Arlene Foster after she bizarrely claimed that fears of a hard border were overblown, because “we never had a hard border”. She told the Dail there was an “unmissable hostility” to Irish interests in sections of the British political establishment. In his response, Mr Varadkar, said: “We had a hard border between Ireland and Northern Ireland. I remember it well during the Troubles... and before the single market in 1993. Mr Varadkar, who is 39 years of age, added: “I remember going there as a teenager. I remember the customs checks, I remember the 24-hour rule, I remember seeing soldiers, and I never want to see those things ever again on our island. “It’s not good enough for those who rejected the agreement to say there won’t be a hard border just because no one wants one,” he added. He also referred to an unguarded comment which was caught on microphone by Tanaiste and Foreign Minister Simon Coveney. All Coveney’s remarks proved, he said, is “that if you use the wrong words, or you say things in the wrong way, people will misinterpret that as meaning a secret plan and there is no such secret plan”.